Those of you who have been following my blog as I visit Upstate New York cities know that I have a few unique forms of personal transportation. 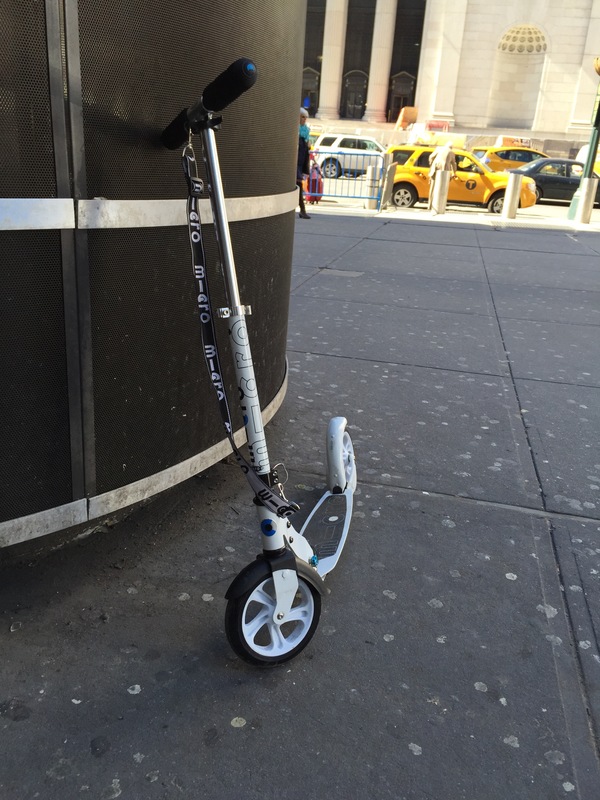 When traveling to urban areas, I like to bring a scooter. Yes that’s right, the thing your kids play on. To be fair, the scooters I have are listed as “adult scooters.” One is electric, with a top speed of 20mph and a range of 10-15 miles. The downside is it weighs 36 pounds. The other is a far lighter “kick scooter” which is unpowered but weighs only about 10 pounds. Why travel by scooter? Because they are lightweight, “last mile” alternatives to walking. Unlike bikes, they easily travel on planes, trains, buses and cars. I can carry the kick scooter on my shoulder and break it out easily whenever I need it. Little did I know it would save me one night. Last weekend, I traveled by train to Miami to shoot a wedding. 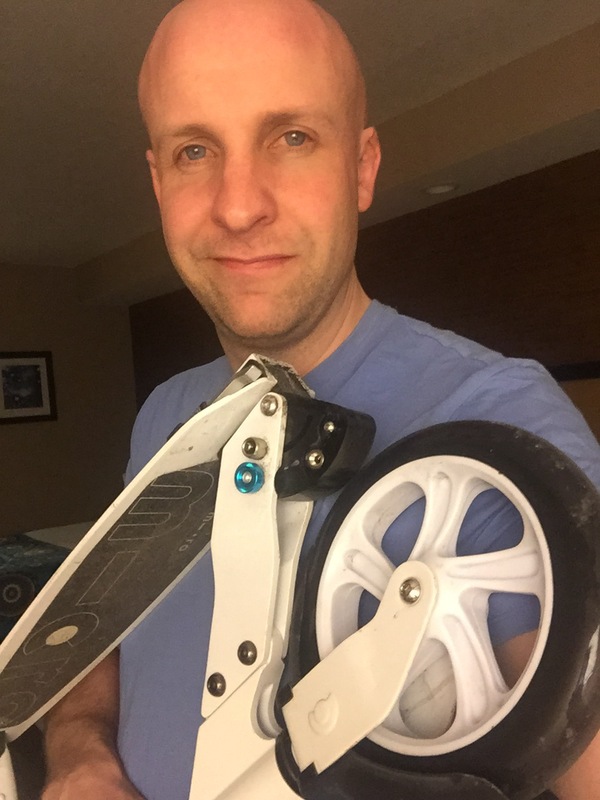 While I was sure I could get a cab or Uber from the train station for the 23 mile trip to the hotel, I brought my Micro White kick scooter just in case. Thank goodness I did. While in the dining car of my Amtrak train on the way to Miami, I lost my debit card. Let me tell you the frustration of having plenty of money and no way of accessing it! When I arrived in Miami, it was with absolutely no spendable cash, 45 pounds of equipment and clothing on my back, and 23 miles to go. Plan A was to rent a car… No access to money. Plan B was to travel by Uber or Lyft, but without a credit card that was impossible. A cab was plan C, out of the question for the same reason. Public transpo wouldn’t get me close to where I was going so plan D was out. It was late so bothering the wedding party for a ride was out of the question. That did it for plan E. I had one viable option and it would be a monumental task… To unfold my kick scooter and travel 23 miles to my hotel so I could get a couple hours of sleep before the busy wedding day. So there I was, face to face with plan F.
It took hours, likely over 1200 calories and some sort of divine intervention but I made it. I made it in time to get decent sleep, allowing me to capture one of the most beautiful wedding days I’ve ever been a part of the next day. By no means am I telling this story to bolster my ego, or make it look like I am a super-dedicated photographer. On the contrary, I almost didn’t write this blog because I very much embarrassed! Instead, I felt it was important to write this as a reminder to all of us that when we plan for the greatest days of our lives, make sure that we, and those we hire to make those days a reality have more than a plan B. More than a plan C. Make sure you and they have a plan F. Hopefully you never have to use it, but in the rare case that you do, you will never ever regret it!